My high-spirited great Aunt Bridget was the original #nofilter. Always, words were coming out of her mouth that caused us to look at one another as if to say, Did she really just say that? For fifty years, she and her husband, Uncle Jerome, both immigrants from Sicily, owned successful side by side businesses — Bridget’s Beauty Shoppe and Jerome’s Barber Shop. Together, they cut out an interior doorway between their adjoining buildings so they and their customers could visit. It was one big happening place. As a young girl, I used to love to go there, sit under the hairdryer hood, and basque in the attention of my Aunt Bridget as she paraded her customers by to see her grandniece. In this photo from 1963, Aunt Bridget is standing in front wearing a white uniform. Uncle Jerome is standing in the back wearing a white barber’s shirt. Aunt Bridget employed a dozen full-time “operators” as hair stylists were known at the time. 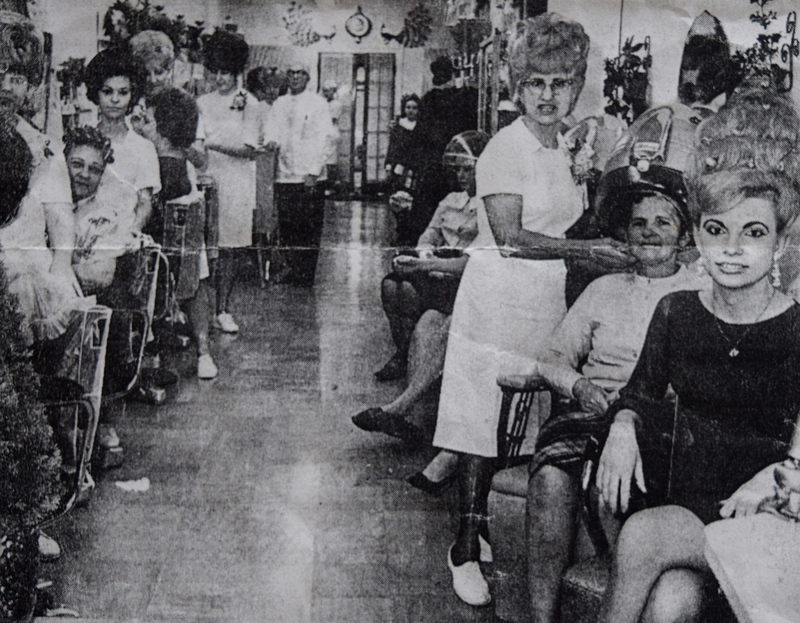 This picture was taken during an era when women went to the beauty parlor once a week to get their hair done. We love the Italian beauty in the front with the beehive! This is how I remember Uncle Jerome and Aunt Bridget. I can almost hear their voices. Upstairs from the beauty shop was a kitchen where Aunt Bridget and her niece, Theresa, made huge pots of chicken soup and meat sauce to feed their customers, friends, and employees. Many years later, in the mid-1970s, I visited my grandparents in Florida for Easter break. In a whirlwind that signaled her arrival from the airport, Aunt Bridget walked into my grandmother’s kitchen, opened her purse, and pulled out an “old hen,” complete with its collagen-laden feet. She announced she was going to make a pot of soup. My only regret is that I spent too much time rolling my 19-year-old eyes instead of finding a pen and paper to write down her recipe. Her soup was the best. I have spent years trying to recreate it. What was so memorable about Aunt Bridget’s soup was the full-bodied flavor and the bite-sized green-speckled meatballs that floated to the surface. 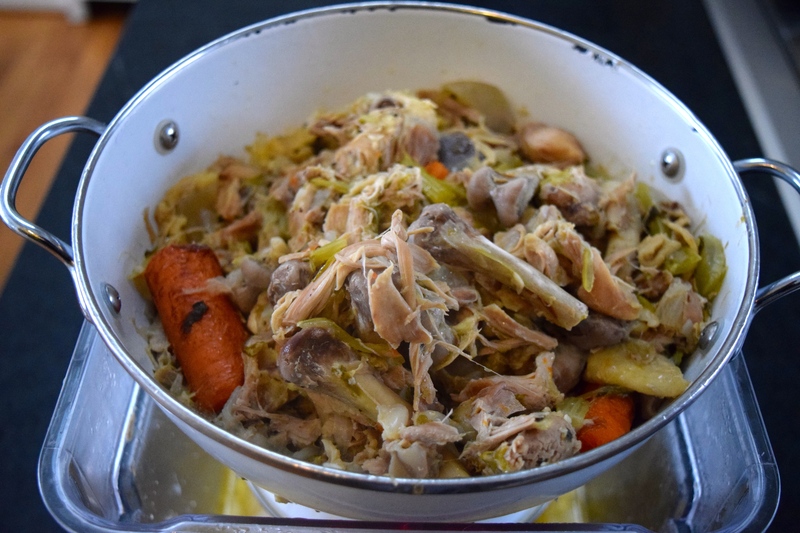 In all of my previous attempts at recreating her soup, I was either left with perfectly cooked chicken meat in a thin stock that had to be boosted with bouillon, or great stock that had tasteless meat. 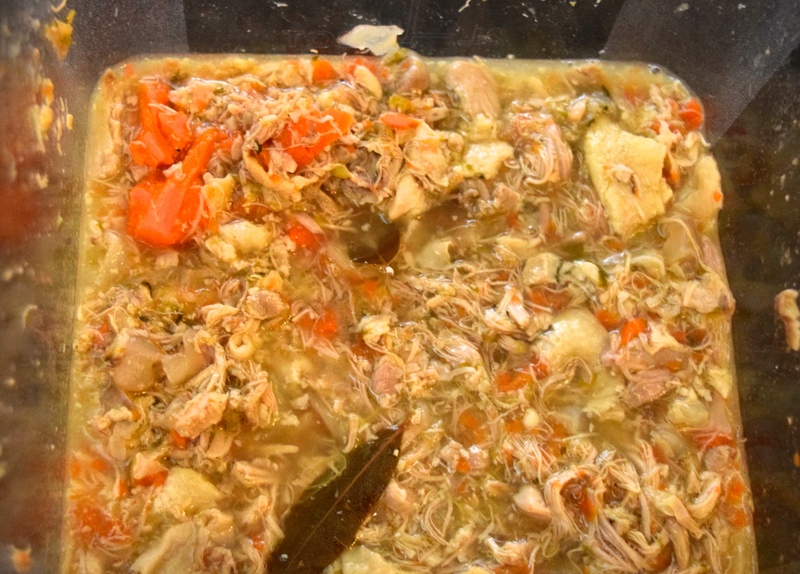 I finally figured out a way to have both, good stock and tasty meat: simmer the chicken parts for an hour and a half, remove them from the pot, pull the meat off the bones and save it for later, and then return the bones, cartilage, tendons, and skin back to the stockpot to simmer for a few more hours. 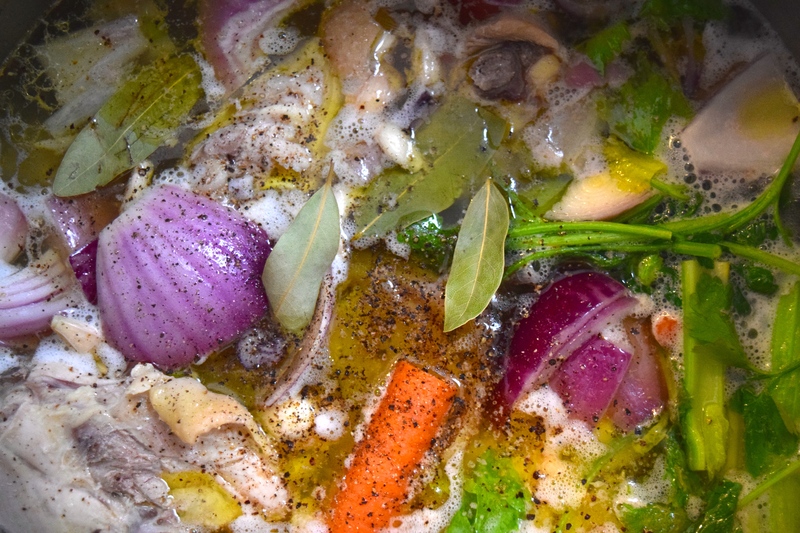 There are essentially 4 components to making chicken stock: chicken parts, water, aromatic vegetables, and seasonings. When I know I’m going to be using the stock for soup, I go ahead and add the salt and pepper as I make it. If I were making stock for use in another type of recipe, I would wait and add these two seasonings later. My mother taught me to use chicken thighs when making soup. As the mother of seven children, she always worried about kids choking on small bones, so chicken breasts with their tiny ribs were out of the question. That’s fine with me because I love the dark meat of thighs and it’s much easier to pull the meat off a thigh bone than just about any other bone in a chicken. 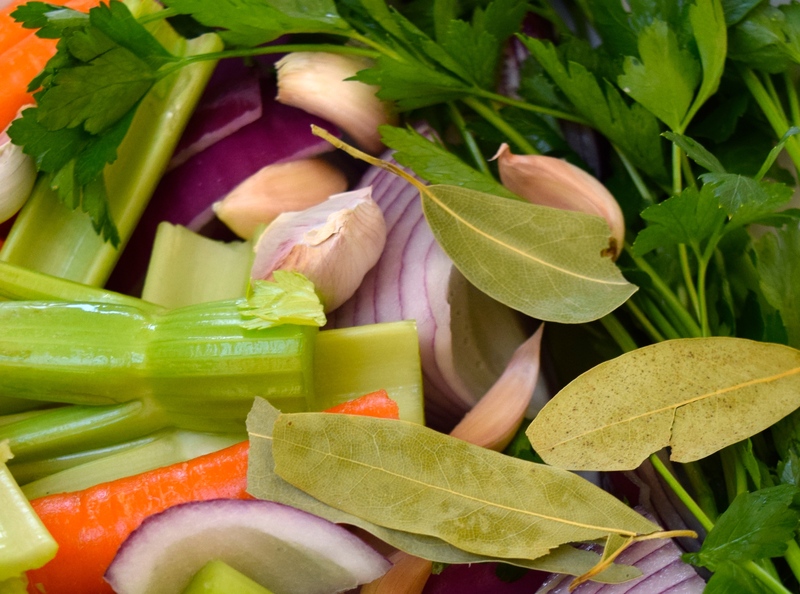 The aromatic vegetables used to flavor a stock are also known as mirepoix (pronounced “MEER-pwah”). 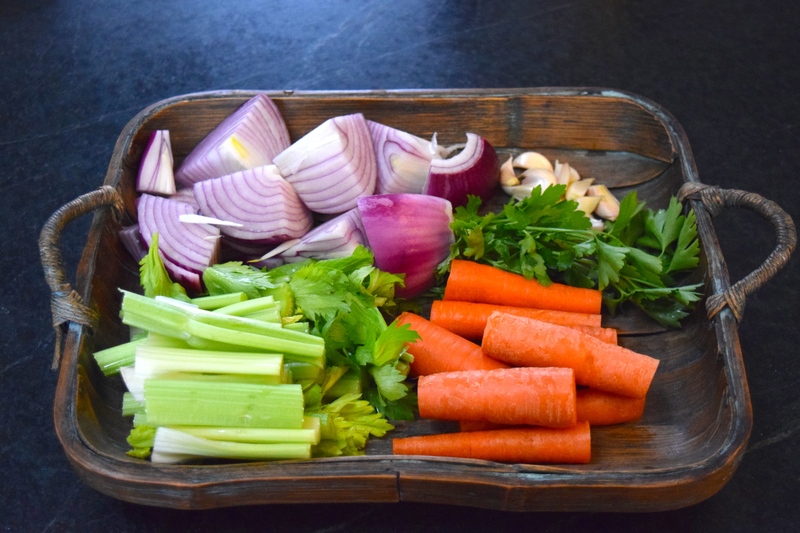 The standard French mirepoix consists of 50% onions, 25% carrots, and 25% celery. Other aromatics are garlic and parsley. Rinse chicken thighs under cold running water and drain in a colander. 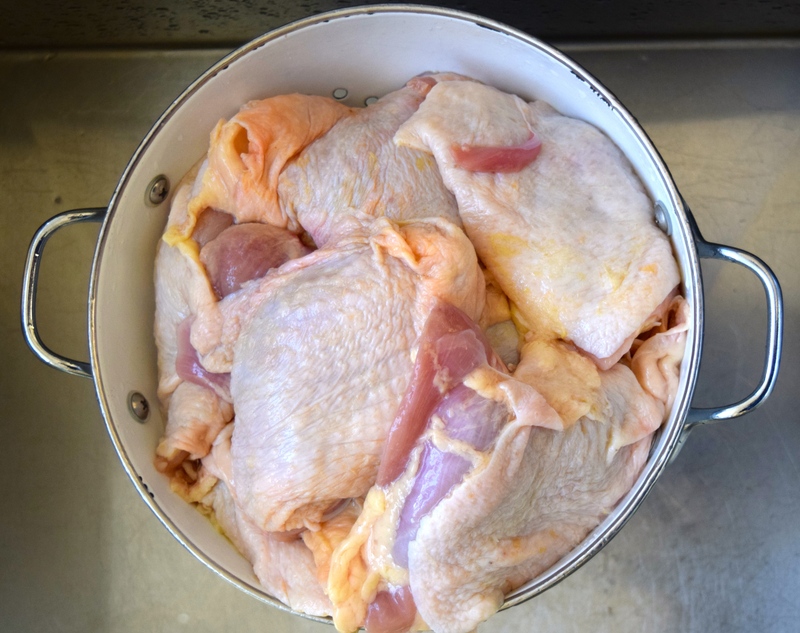 Put rinsed thighs in a large stockpot. Cover thighs with cold water. Cold water helps proteins aggregate so they can be removed with a wire mesh strainer when the stock is finished. If you start with hot water, supposedly the stock tends to become cloudy. Bring the chicken and water to a slow boil. You’ll start to notice foam forming on the surface. After 5 minutes of cooking, remove foam with a slotted spoon. Discard foam. Wash all of the vegetables first. There is no need to peel them. Add the mirepoix to the stockpot. Add bay leaves, garlic, parsley, salt, pepper, and vinegar to the stockpot. The acid in the vinegar will help break down the cartilage on the bones and pull out the minerals, such as calcium, from the bones. Lemon juice would accomplish the same thing. Bring the stock to a boil. Reduce heat to low and simmer for 90 minutes. Do not allow the stock to come to a hard boil or the stock will become cloudy as it emulsifies the remaining fat from the bones. After 90 minutes of simmering, use a slotted spoon to remove thighs from the stock. Allow thighs to cool for about 10 minutes. Remove thigh meat from bones. 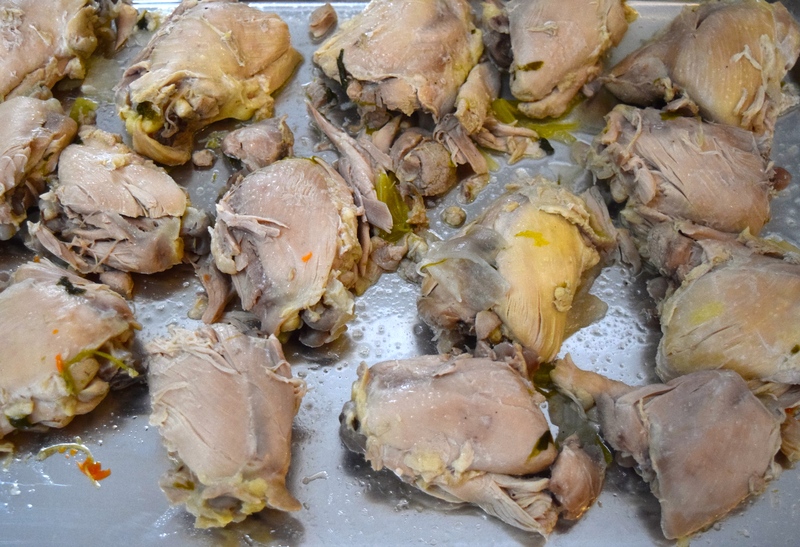 This meat is very moist and tasty and can be added back to the soup later, or it can be refrigerated (or frozen) until needed for another recipe. Save the bones, cartilage, tendons, and skin to put back in the stockpot. Simmer on low heat, uncovered, for another 3.5 hours. Bones, cartilage, and connective tissue contain a protein called collagen. As the bones simmer in the water, collagen breaks down and turns into a gooey gelatin. This gelatin is what you are going for. 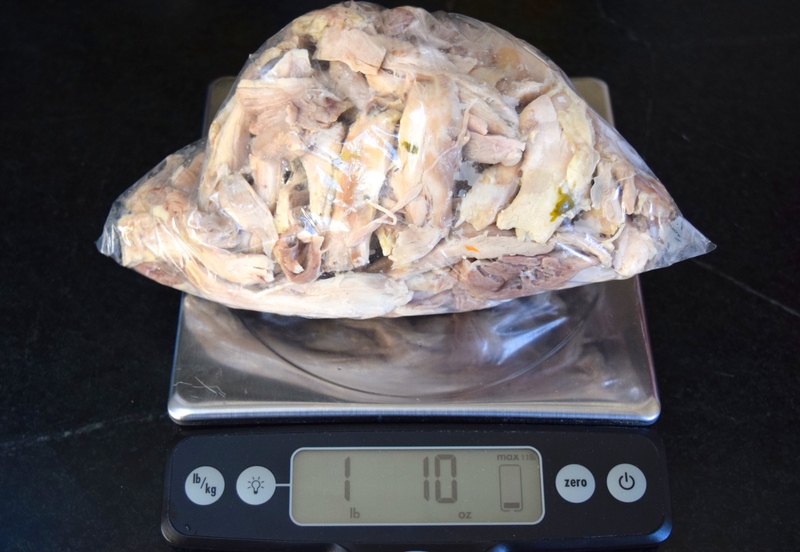 It’s what gives chicken stock its full-bodied flavor and it’s what makes the stock have a Jell-O like consistency. 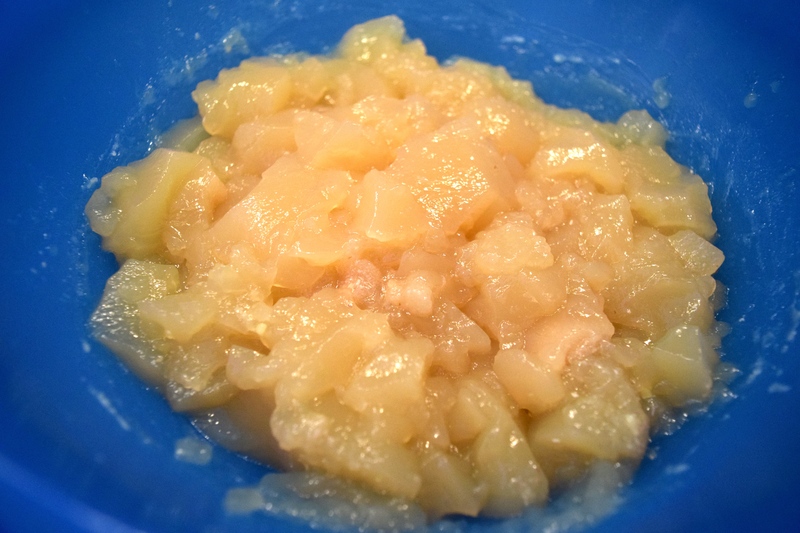 The gelatin is the secret to a good chicken soup. 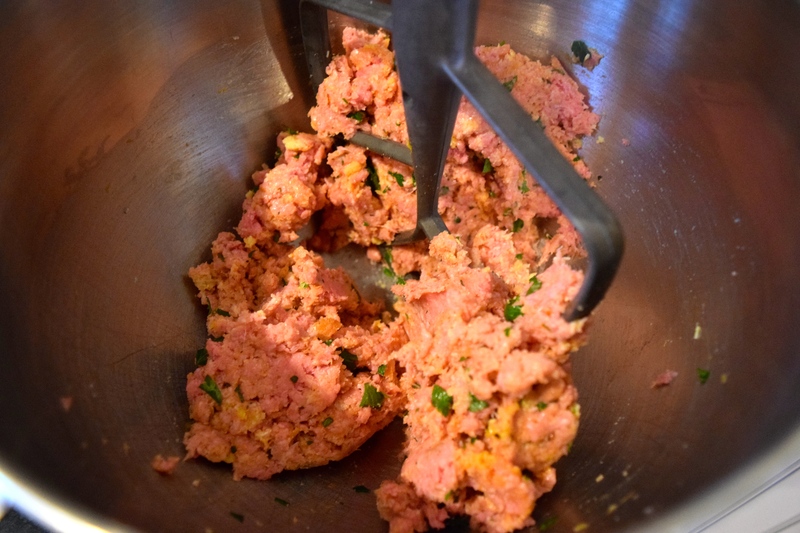 In fact, I think the reason my Aunt, and my Grandmothers, for that matter, served their chicken soup with little meatballs was because after they had cooked the heck out of the chicken meat there was no more flavor in it and they still needed a protein to serve for dinner, thus they added the meatballs. 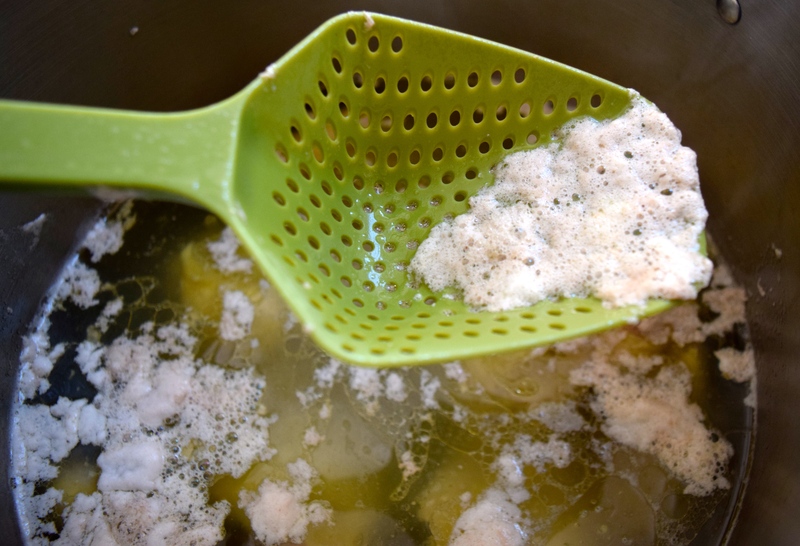 After the stock has cooked for five hours, strain it through a colander over a clean, empty storage container. 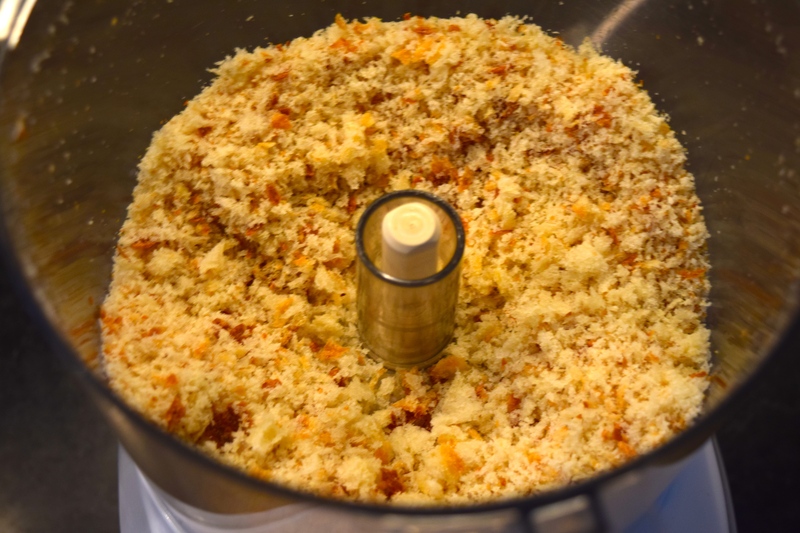 You will want to have about 4 quarts of stock when you are done. A lot of times when I make stock I am left with only 3 quarts. To make up the difference, I put the solids from the colander into a separate bowl, pour a quart of plain hot water in it, swish it around, and then pour that rinse back through the colander. The liquid that comes out is incredibly flavorful. By the same token, if I have over 4 quarts of stock, I put the stock back in the stockpot and boil it down to 4 quarts, otherwise the stock may be too dilute and not gel properly. As for the solids remaining in the colander, I throw the bones in the trash and save the rest for our pets. 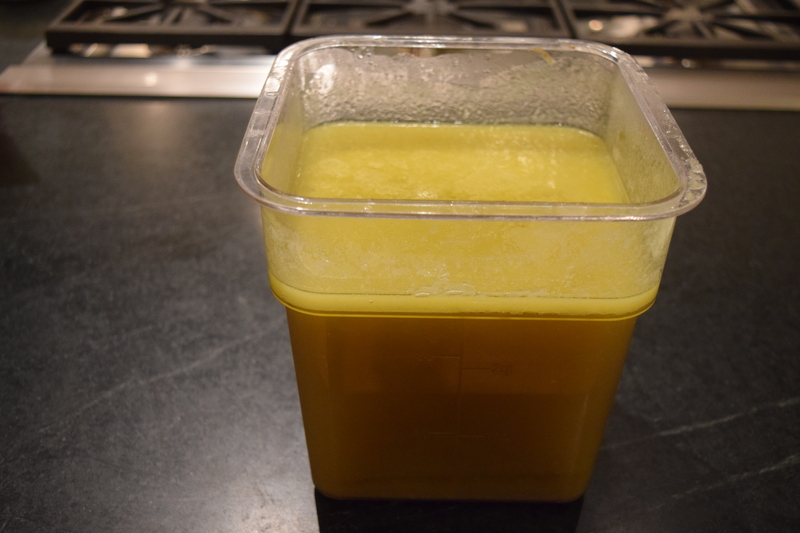 Take the stock in the storage container and refrigerate it until the fat rises to the top and congeals. Use a spoon to scrape off the fat. As a time saver, many people make their stock in a slow-cooker overnight and then strain it in the morning before going to work. They then refrigerate the stock until they are ready to use it later in the week. Now, to make my version of Aunt Bridget’s chicken soup! 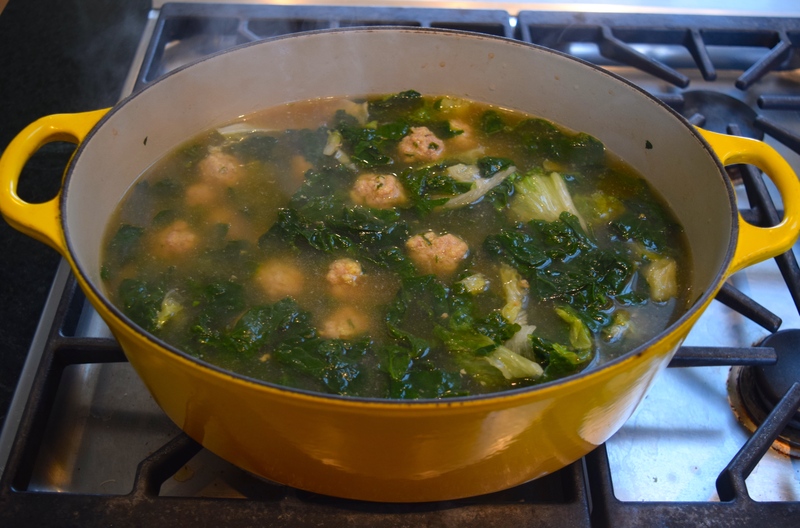 Because the stock is so flavorful, I am making a very simple soup of stock, little meatballs, and greens. I chose to use spinach for the greens because I had a lot of it in my garden. Other excellent choices of greens are escarole and endive. 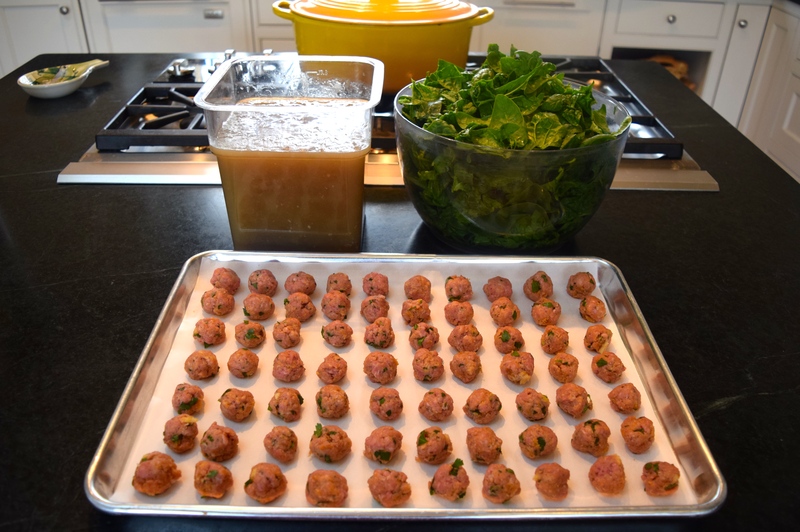 The first step will be making the meatballs, followed by prepping the greens. My Grandmother’s meatball recipe that I typically use in tomato sauce didn’t work in this soup. The flavor and texture weren’t delicate enough. After looking through many family recipes and Italian cookbooks, I decided to omit the onions and add lemon zest. I really liked the results. 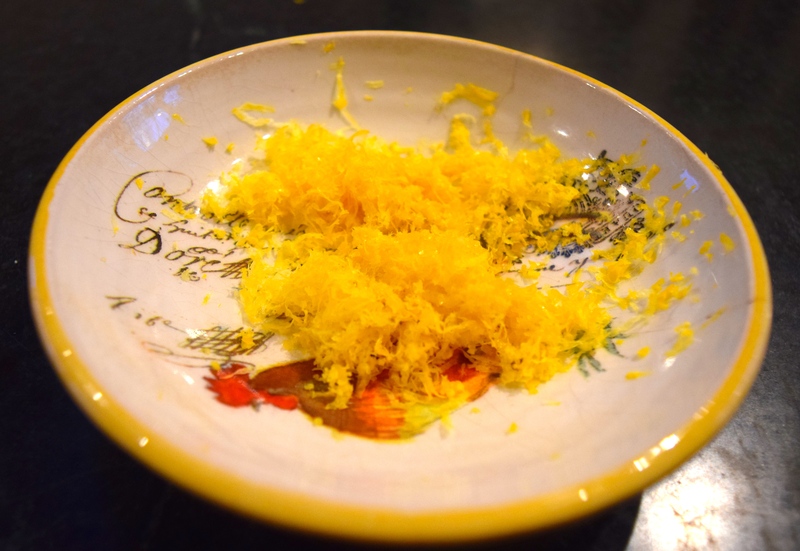 I look forward to one day trying the same recipe with orange zest. 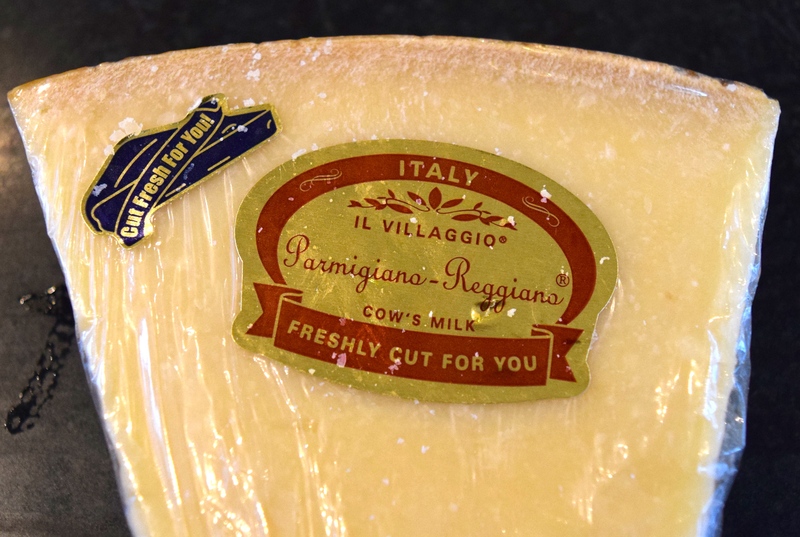 Grate the Reggiano Parmesan cheese or buy pre-grated cheese from the store. 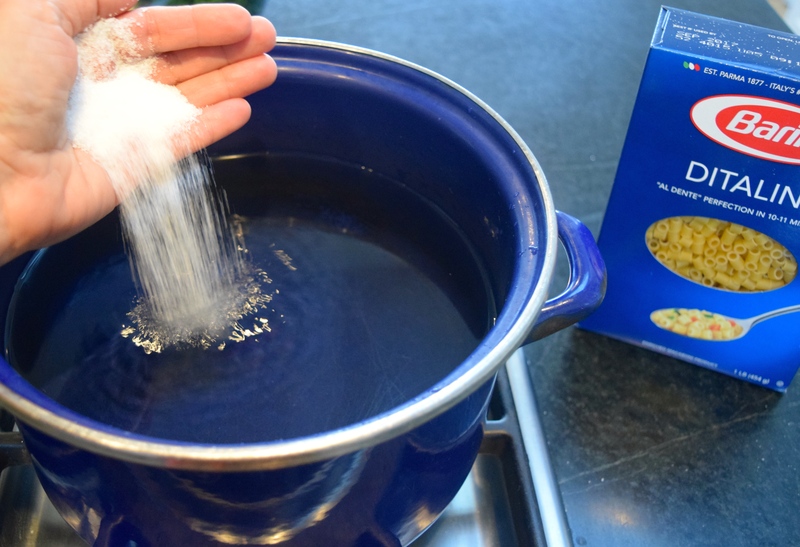 To learn how to make your own bread crumbs, go here, or buy panko bread crumbs from the store. 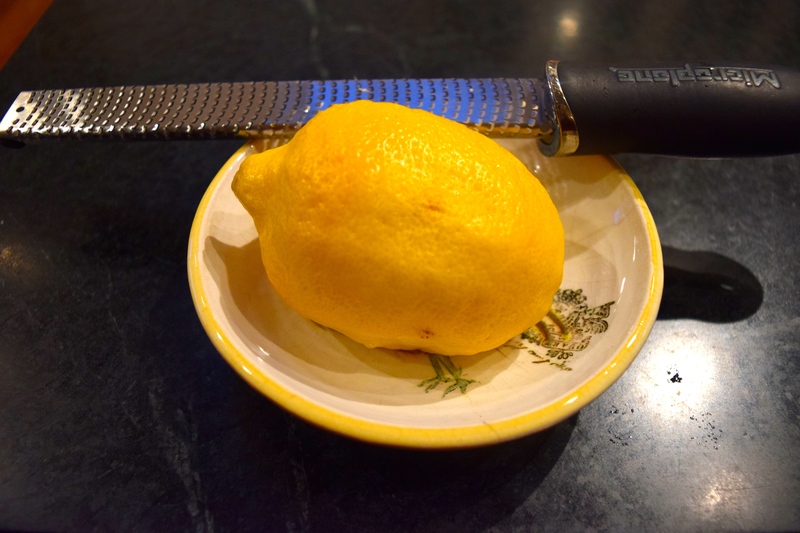 To learn how to zest a lemon, go here. 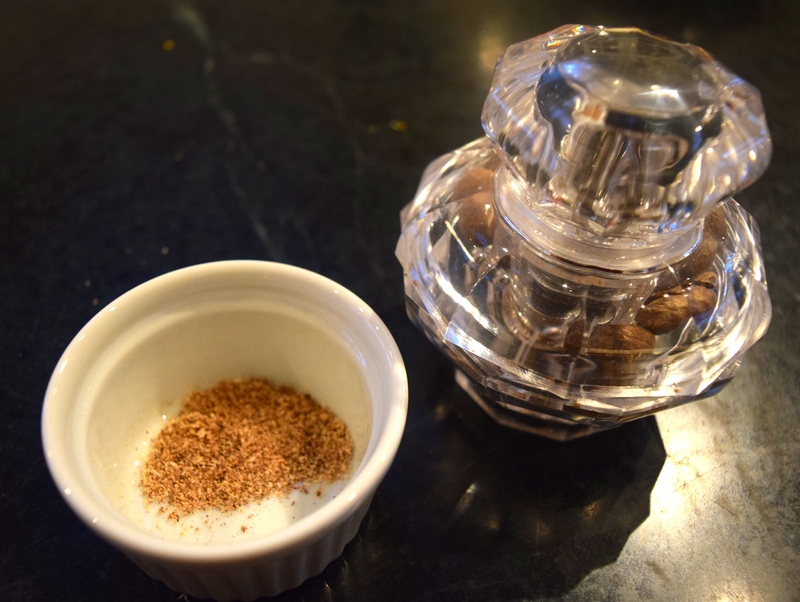 Use a nutmeg grinder to grate a whole nutmeg, or use already ground nutmeg from the grocery store. 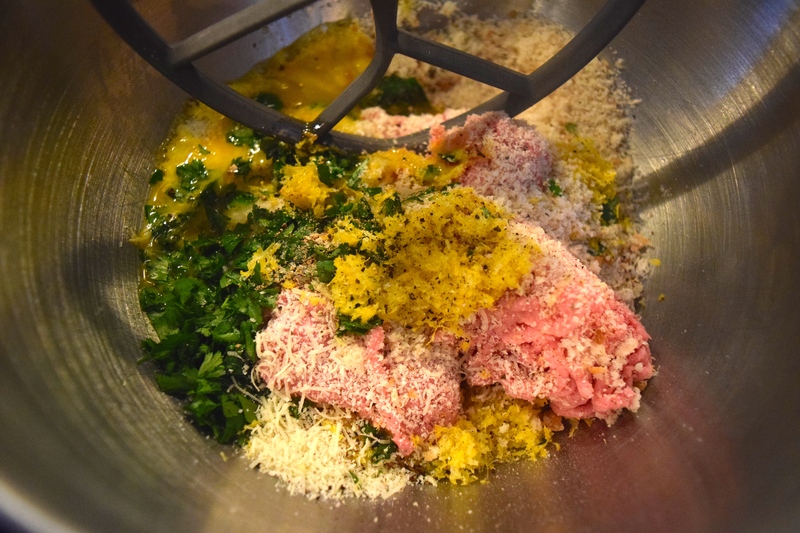 Place all ingredients in a mixing bowl and mix gently until just blended, less than 30 seconds. As you add the salt, go easy because the Parmesan is salty. 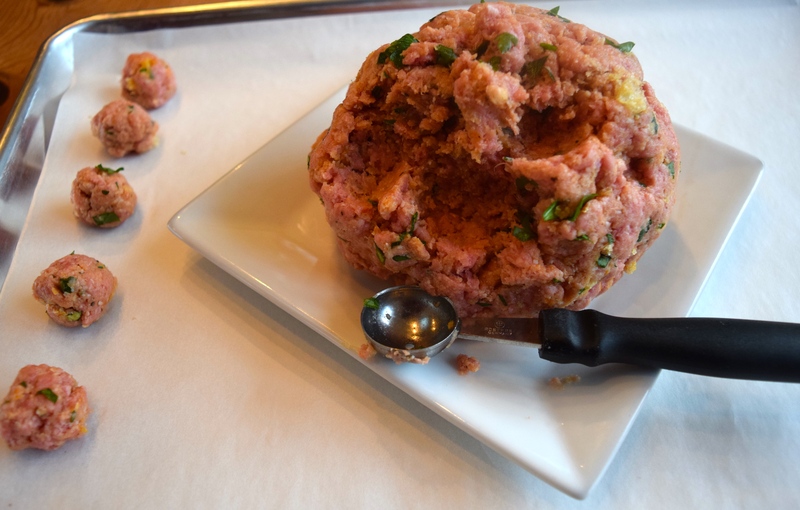 Use a melon scoop to make bite-sized meatballs and place on a 13″ x 18″ baking sheet. 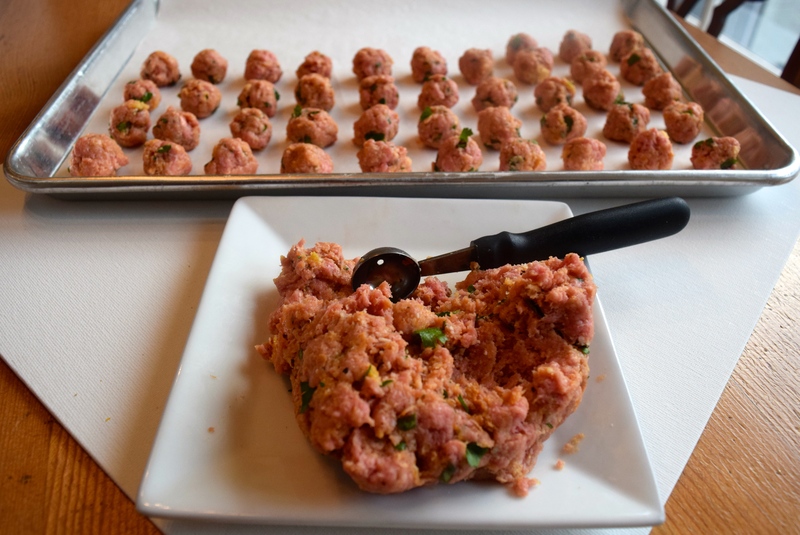 I weighed the meat mixture before making the meatballs and it weighed 1.5 pounds. I got 70 meatballs from it. You could make them even smaller if desired. 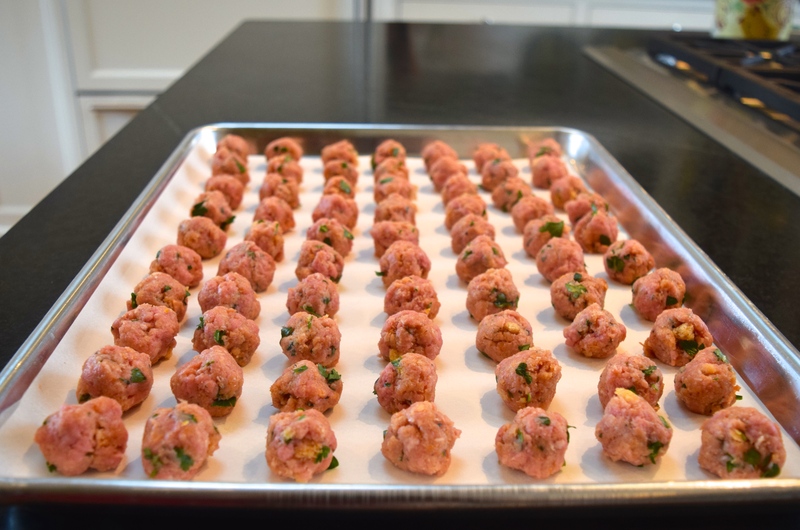 Set uncooked meatballs aside for now. You will be cooking them in the soup, not in the oven. 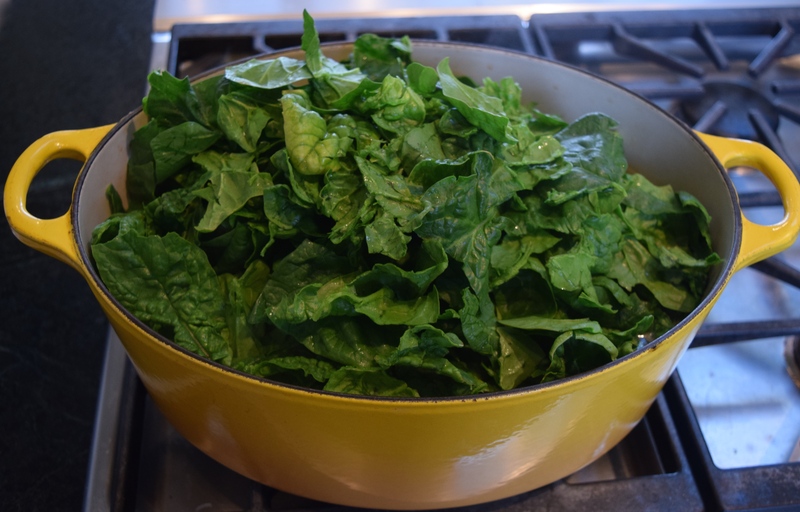 Next, I used one pound of freshly harvested spinach from my vegetable garden. 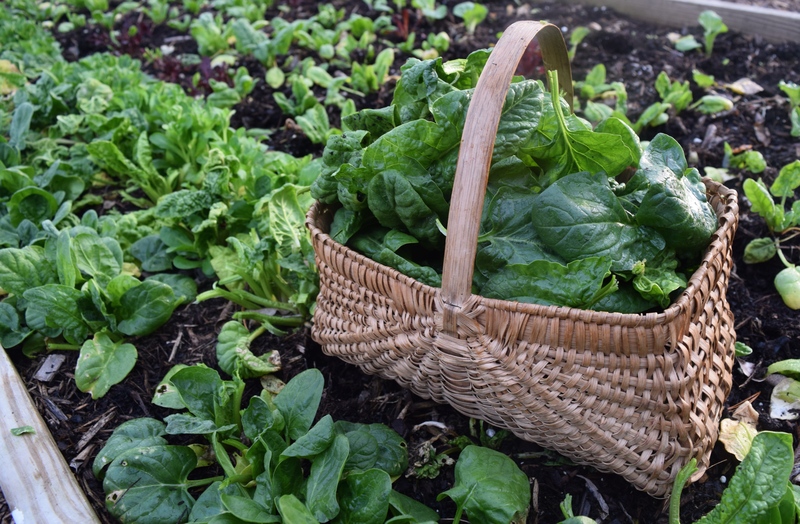 Hard to believe, but the spinach actually survived our icy cold winter this year. It was grown in a raised bed, protected by agriculture fabric held up by hoops. 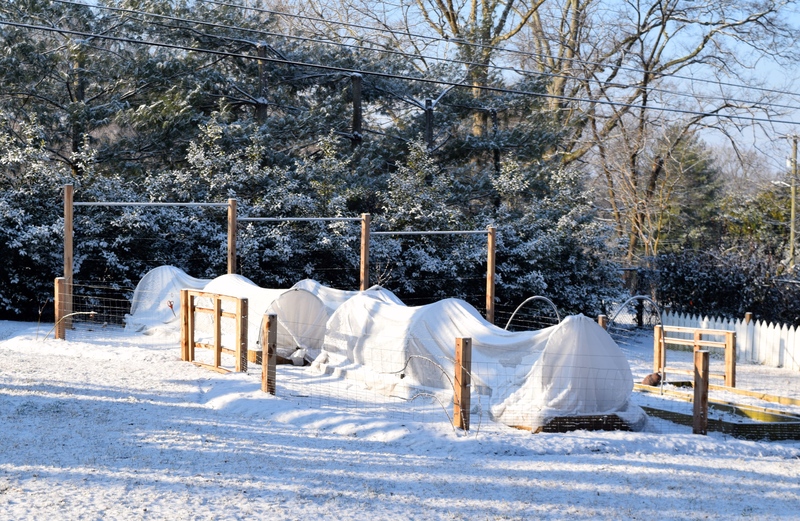 I think the iced-over cloth acted as an igloo and kept the vegetables warm enough to remain viable. The picture above was taken on 10/7/14. There is a netting over the plants to keep little animals out. 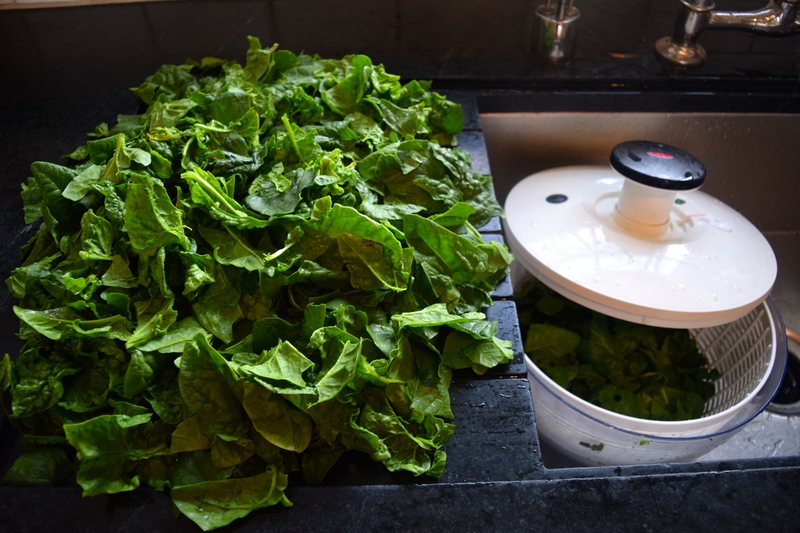 The spinach was washed and spun and the stems were removed. I tore the leaves into smaller pieces. 1) Bring chicken stock to a boil. 2) While waiting for stock to boil, put a pot of salted water on the stovetop to cook the pasta. I never cook pasta in the soup because it drinks up all the liquid and the noodles become mushy. I also store the soup and pasta in separate containers in the refrigerator for the same reasons. 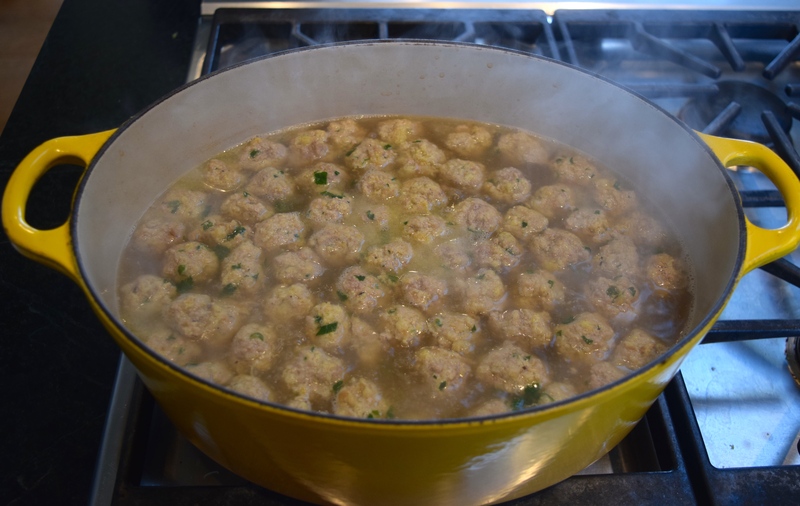 3) When the soup stock boils, add the little meatballs. Cook for 5 minutes, stirring occasionally, then turn heat off. 4) Add the greens immediately (while the stock is still hot) and stir. 4) Drain pasta when cooked and set aside. You can sprinkle a little olive oil on the noodles to keep them from sticking together. 5) Fill each soup bowl with about 1/2 cup of pasta and then add the soup. 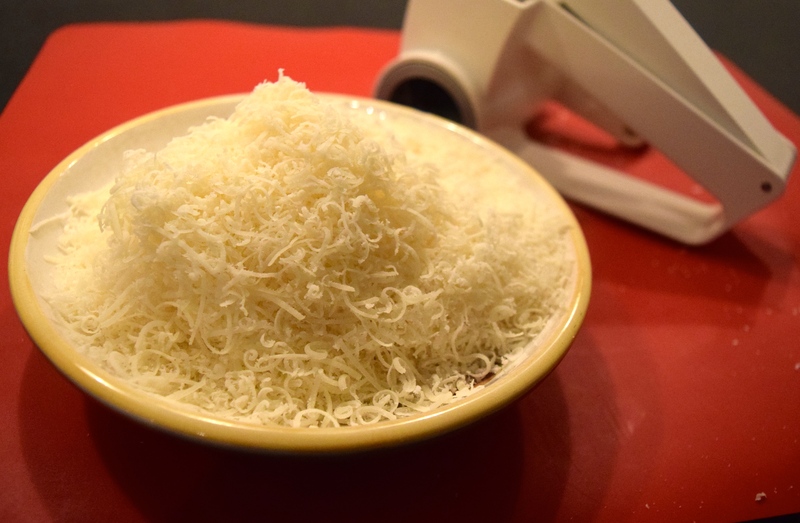 Sprinkle soup with grated Reggiano Parmesan just before eating. Only the most memorable great-aunts get chickens named after them. 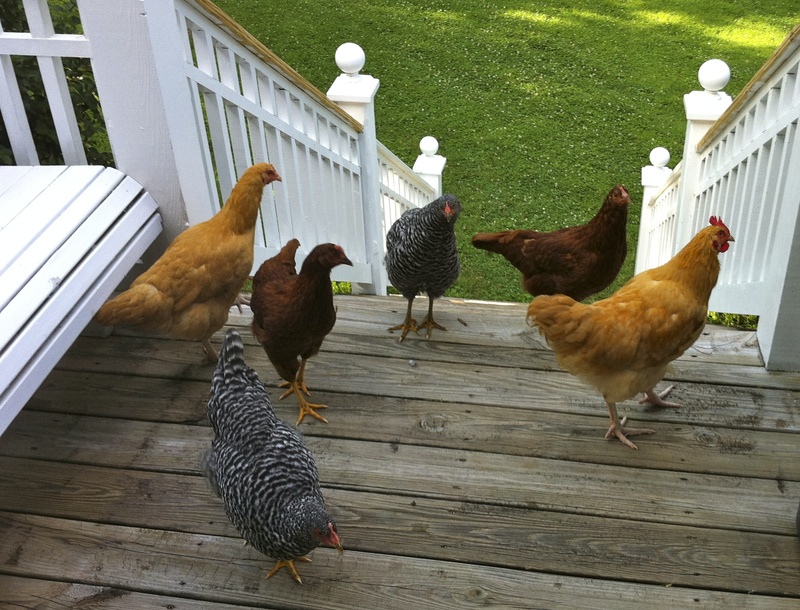 Our two Rhode Island Reds were named after sisters, Bridget and Josephine. The two blonde Buff Orpingtons were named after my husband’s blonde grandmothers, Mildred and Alice. The two dark chickens were named after my brunette grandmothers, Marion and Concetta. WOW!!!!! This is your best post EVER!!!!!!! Judy, this sounds like the soup my grandma Phil would make. But she also on occasion would add the chicken feet. She would burn the small feathers that were on them over the burner. I remember my mom and Aunt Jean loved the feet. Judy, I loved this post! Both family and food are warm, wonderful and so real. Thanks, Laura. I’m sure you’ve already heard all the folklore about Aunt Bridget and family in one of our many small group gatherings at church. Thanks for commenting! Have lots to do in the yard on this gorgeous day. You have a great day, too! Judy, as the other readers have remarked, this post was simply terrific. I love the stories that you always connect with the food. On a related note, I made your granola and we have enjoyed it regularly. (We also followed your suggestion to try Kefir, which is great stuff!). We will be bringing some of your granola when we visit Pat & Caroline soon — your goodness travels far! I like that, Beth- your goodness travels far. Thanks for the compliment! We’re all over the granola, too. We make a new batch every weekend. You need to try this soup. 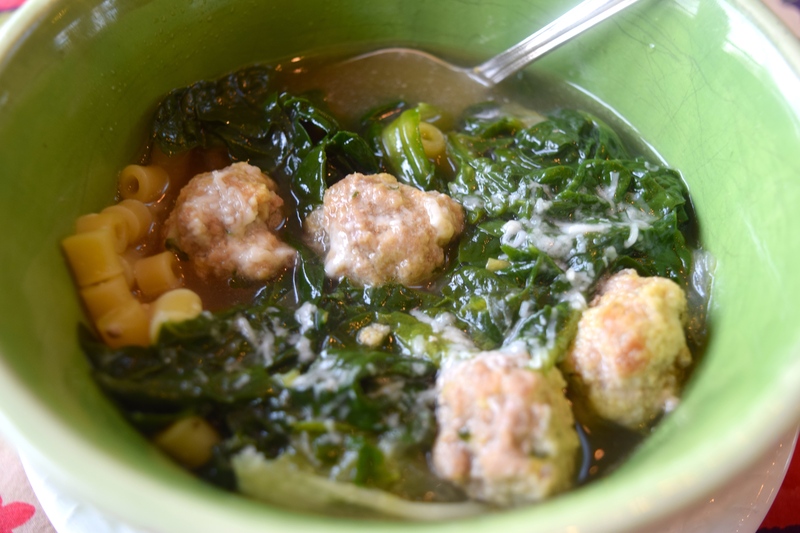 Make it with boxed broth if you don’t have time to make homemade broth– I just want you to try the meatballs. The lemon zest and nutmeg in them- oh my goodness! They’re delicious. Take care. Loved the picture of Pat, Caroline and Charlie that Marion posted. My big sister is very impressive. The story line is better then the soap! Thank you! 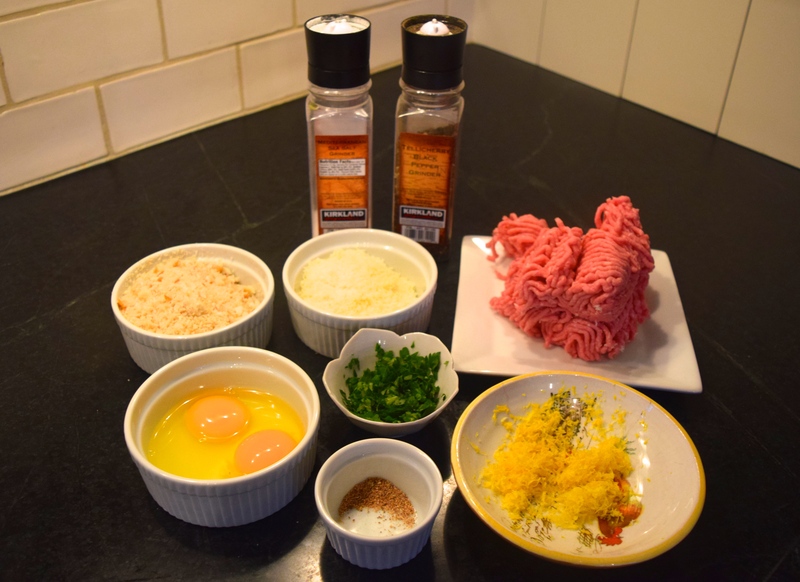 The meatballs are delicious with their lemon and nutmeg. I have varied the greens — escarole, spinach, endive. They all taste good. I checked out your website and enjoyed reading many of your posts. Thanks! Betsy, I think kale would work fine. Italians are very fond of putting escarole and endive in their soup, too.